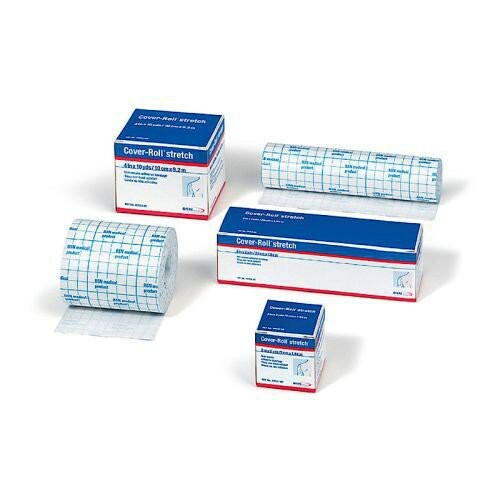 The Cover-Roll® Stretch Fixation Dressing 45553 by BSN Medical is a 4 inch wide dressing available in a 10-yard roll. This quantity is helpful in surgical facilities where the dressing is placed over wound dressings to heal surgical sites or exuding wounds. 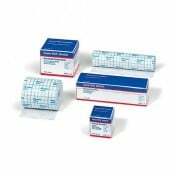 The BSN Cover-Roll® Stretch is particularly beneficial for placement in bendable regions of the body to create movement while wound is healing. 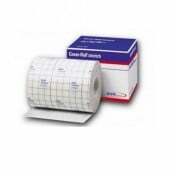 Cover-Roll® Stretch is easy to apply and offers gridlines on the paper backing to cut to size of the wound. After removing the paper backing, the adhesive will firmly secure all four sides of the dressing. It also adds natural light compression. The polyacrylate adhesive is gentle to the skin and can be easily removed using rubbing alcohol . The radio-transparent construction allows dressing to remain in place during X-ray exams.